You’ve customised your cover letter to the role and company, drafted compelling opening and closing lines, and even figured out how to address the most frequent issues about writing cover letters. But your job is not yet done. Once you’ve got a working draft, it’s time to grab your red pen. Double check your cover letter to make sure you’re not using any of the words and phrases below that might sabotage your changes of securing a job interview. Why avoid this phrase? : If you don’t have the name of the person to whom you can address your cover letter, you should make every effort to find it using Google, the social media (LinkedIn, Facebook), company website, the telephone, a contact within the company, or whatever other means you have. Using a generic salutation can create a negative first impression and may suggest that you’re not quite resourceful to find out who the Hiring Manager or Recruiter is for the role. A better alternative: “Dear Mr. Jones,” or “Dear Ms. Fox” (Indicate the real name of the person to whom you are addressing the letter). Why is this better? By addressing the Hiring Manager or Recruiter by name, you’re able to create a personal connection and it also shows that you put in the extra work to find out the recipient of your cover letter. Why avoid this phrase? : Opinion phrases show a lack of confidence. This adds a level of doubt to your sentence, which is not exactly the kind of message you want to convey to your prospective employer. Why is this better? These phrases show assertiveness and conviction without sounding arrogant or pretentious. These also eliminate any element of uncertainty, ultimately securing the trust and confidence of your potential employer. Why avoid this phrase? : Avoid using language that your recipient will have to look up in the dictionary, or that will overcomplicate the message of your cover letter. Applicants who use highfalutin words in their writing are thought of as untrustworthy and overcompensating by their colleagues. Why is this better? Writing in clear and simple English will guarantee that Hiring Managers and Recruiters can relate to you as an articulate human, and not as an alien from another planet. It’s always best to write in a way that enables the employer to understand what you are saying without the need for them to speculate. Why avoid this phrase? : Most applicants unconsciously use this phrase when submitting their cover letter. It’s a phrase that shows a lack of confidence and comes across as being apologetic. This phrase, especially when used in the opening line, is also generic and unmemorable, not giving the Hiring Manager or Recruiter something to get excited about or be intrigued by. Why is this better? If you’re genuinely interested about a specific industry, attracted to the company’s brands, or have used their products or services before, this is a great opportunity to say so. Employers value real enthusiasm since it often translates to highly motivated and successful employees. “As you can see on my resume” – This is a common filler phrase. But if the Hiring Manager can see something on your resume, announcing its presence is not necessary. “Really, truly, deeply, totally, very” – Flowery language and excessive adverbs can come across as insincere. A sentence without these fillers is more succinct. Excellent cover letters create impression that attracts potential employers to proceed reading your resume. On the contrary, bad cover letters repel recruiters. You can control how your cover letter introduces you by avoiding these undesirable words and phrases. 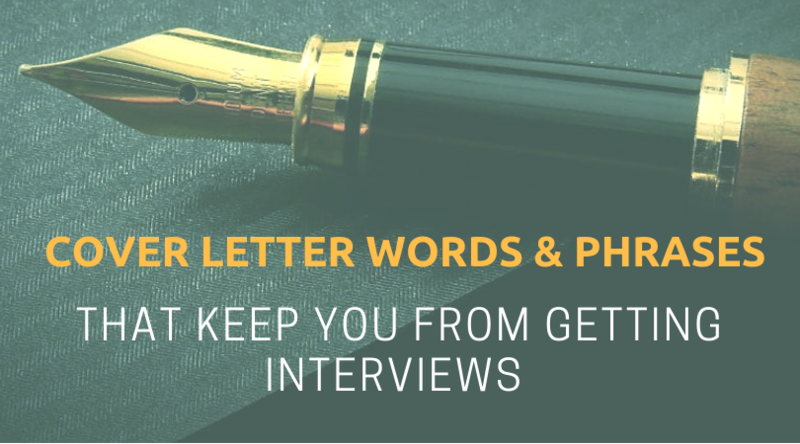 Why not start revisiting your cover letter now?